Designed for optimum visibility, acrylic lead boxes add a touch of elegance and class to your lead box marketing and send a positive message to the potential client by showing off a high quality look. Acrylic lead boxes will generally gather more leads than other types of boxes. 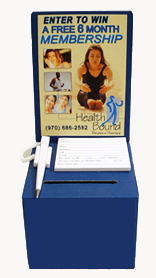 If quantity on a lower budget is your goal, cardboard lead boxes are very cost-effective. Our unique easy open/close tabs on bottom of the box means they do not lose their structure after repeated use. Durable and compact and available in blue, yellow or black, our cardboard boxes can't be beaten! Full colour, customised artwork is not only professional, it's major branding for your business. With our template artwork designs, we can add your business information and logo. 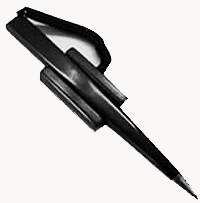 Our lead box accessories include lead box pens, lead box pads and lead box covers (for cardboard boxes only).Lead box Accessories are the finishing touch you need to make your lead box both presentable and professional. Acrylic lead box starter kit - everything you need! Includes 6 boxes + 6 pens + 6 pads. Designed for optimum visibility & great looks, our acrylic lead boxes send a positive message to the potential client by showing off a high quality look. 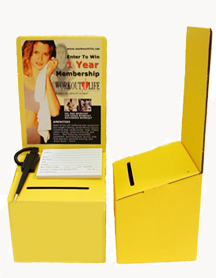 Acrylic lead boxes and cardboard lead boxes which can be used as suggestion boxes, ballot boxes, competition boxes, donation boxes, charity boxes, collection boxes and display boxes and entry boxes. Typically smaller in size than other lead box solutions, our lead boxes can be easily placed in prime locations near the check out or cash register where real estate is very valuable and a larger box may not fit or be accepted by a retail business. 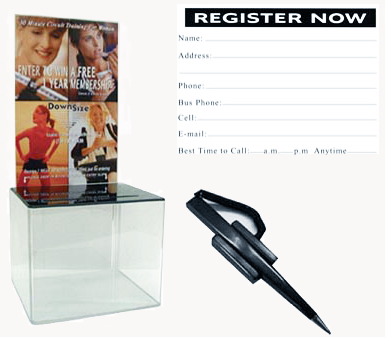 Artwork for any type of lead box marketing can be cruicial to the success of the campaign. With premade and custom design artwork for acrylic and cardboard lead boxes, we have the solution for a successul outcome of your lead box project. Lead generation using acrylic or cardboard lead boxes is one of the most cost effective marketing strategies your business can employ. Lead boxes generate a steady flow of qualfied leads and enquiries that ulitmately become the basis for new business sales. A lead box in a well-placed location can generate 5-20 leads per week. If you get just 20% of the leads to visit your business and you close 50% (most businesses do better than that) this will give you approximately 1-3 new customers or clients per week. Lead Box Australia has been supplying lead boxes since 2004. In this time, we have grown to be the largest supplier of lead boxes and accessories in Australia and New Zealand. What started of as a supply niche for the gym and health club industry, we soon realised that LEAD BOX MARKETING can cross over to many other types of businesses and now supply lead box solutions to educational organisations, local government, professional trade and services, the martial arts and beauty industries, talent agencies, corporate organisations and many, many more. 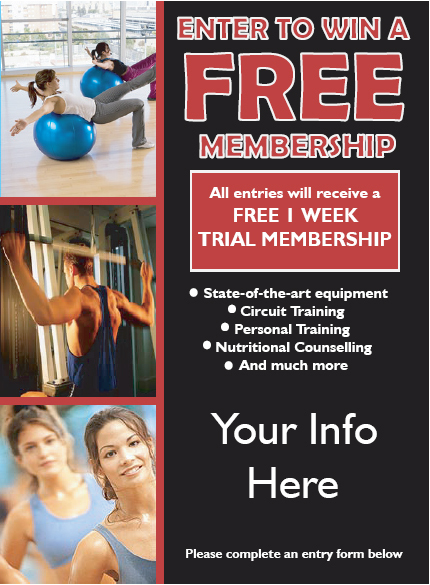 Through feedback and the study of market trends in gyms and health club, we determined that lead box guerrilla-style marketing is one of the most cost effective means of creating new leads for your business. Lead box marketing is a time-tested system that is now utilised by many industries with successful results. We consider ourselves as experts in designing eye catching and successful graphics to compliment your boxes. Design is just as important as the box when creating a successful lead box or competition box promotion.